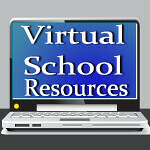 Virtual School Resources: Win The $10,000. Scholarship Sweepstakes from GradSave! Win The $10,000. Scholarship Sweepstakes from GradSave! I've been sharing with you recently about the awesome program GradSave offers for saving for college. It saddens me when I talk to people who think college is not an option as they just don't have the money. Planning for college should not happen in your child's junior year! I have a junior, and we have been planning for college since she was born! That does not mean you should not do it at all if you do already have a child in high school, but it does mean you should begin right away. The U.S. Census Bureau reports each year on the difference in salaries from an individual with a college degree versus just a high school diploma, and it is typically double! I feel like it is my job to give my kids the best start in life I can, and for us, as a family, education plays a huge part. You can open a GradSave account right now (it's free!) and start with as little as $10. Make a commitment to continue to add and watch your college fund grow! The GradSave site has lots of information available to you, too, like how to open a 529 account so you can receive the special tax benefits allowed by your state (529 plans can differ from state to state.) You can even read testimonials from Happy GradSavers! Right now GradSave has a special promotion saving you $10 when you open and make a deposit in a GradSave account! You'll see the $10 come off when you check out. Easy! I'm excited to share with you a way that you could win $10,000. to begin or add to your child's scholarship fund! 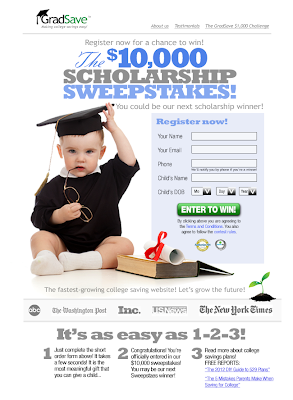 The GradSave $10,000 Scholarship Sweepstakes is easy to enter! You could be their next scholarship winner! What are you waiting for? Good luck! I will be chronicling our journey to college over the next couple of years, so I hope you'll be back to read more. I'd love it if you subscribed! Eligibility. If you are an individual legal resident of the United States (except for the State of Rhode Island) or the District of Columbia and are 18 years of age or older at the time of entry, you are eligible to enter the Sweepstakes. Our employees, their immediate family members (spouses, domestic partners, parents, grandparents, siblings, children and grandchildren), and our affiliates, advisors or advertising/promotion agencies (and their immediate family members) are not eligible to enter the Sweepstakes. Prize. We will award one (1) Grand Prize Scholarship that will be payable, at the option of the winner, either as (i) a deposit of $1,000 per year for the next 10 years into a child’s college savings fund ($10,000), or (ii) an up front payout of $4,000, which represents the present value of an investment in a college savings fund for a 1 year old with withdrawals starting at age 17 and a 6% compounded annual rate of return on such investment (This just shows you how a college savings fund grows…); provided that, if the winner is a resident of the State of Florida or the State of New York, such winner must select the upfront payment of $4,000. IN THE CASE OF A SINGLE PAYOUT OPTION (I.E., OPTION (II) ABOVE), ACTUAL FUTURE VALUE OF SCHOLARSHIP MAY VARY BASED ON THE RETURN RATES OF YOUR PARTICULAR COLLEGE SAVINGS FUND AND/OR THE AGE OF CHILD. Odds of Winning. Odds of winning depend on the number of eligible entries received. Certain promotions will be held where additional entries will be awarded as prizes for action, which may include liking us on Facebook, entering free photo contests, etc. Check our home page at www.gradsave.com for more information on these free promotions. This post was sponsored by GradSave. All opinions are my own.